In a privileged location in the center of Agios Ioannis, a brand new luxury resort captures the magnificent essence of island living, with its elegance, simple decor, airy interiors and expansive terrace open onto spectacular views. Anax Resort is a splendid property, in an idyllic setting which offers superb quality and comfort throughout. Sumptuous in its white interiors and rounded archways with the occasional dash of color and contemporary furnishing; it is intimate, private and secure, architecturally designed for aesthetic living, entertaining and relaxing. Combining unique Cycladic architecture and designer pieces with warm woods and curvy shapes Anax Resort is the utmost place to indulge. This postcard-perfect getaway offers maisonettes and suites that are luxurious and lavish; yet maintain a fine balance with nature. With a cool, all-white palette that is peppered with texture and color, they are well appointed and the service exemplary; they seem to encapsulate the eternal allure of the island and each of which enjoys stunning views across the azure Aegean waters. 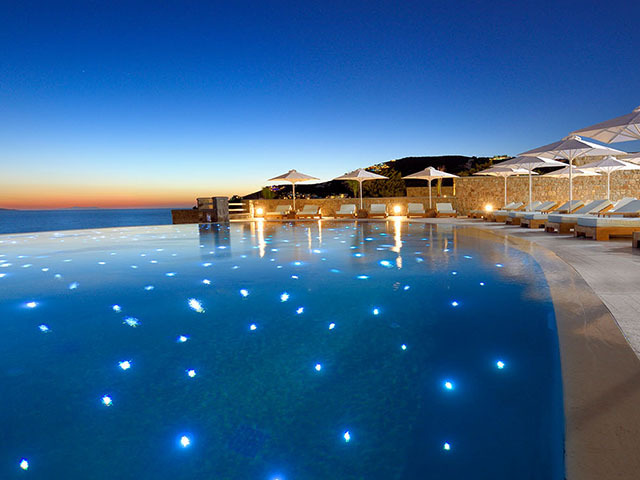 Escape the frenetic pace of everyday life, into luxury’s very own lap at Anax Resort Mykonos. Time stands still—and yet there is never a dull moment. Within this oasis of calm set in paradise, lounge by the infinity pool over the crystal clear blue waters. Savor the best from the culinary world with carefully selected ingredients sourced both locally and globally to please your palate. Sip leisurely on your cocktails at one of the resort’s bars as you take in the awe-inspiring views of fiery Aegean sunsets. Needless to say, each of our restaurants and bars offers a spectacular and unbelievably romantic experience. The Resorts Wellness& Spa Center is a haven of tranquility, which offers a full menu of ultra-pampering treatments designed to restore well-being to the body and mind in laid back but luxurious atmosphere. Additionally for the shopping lovers the Anax’s Boutique provide a microcosm of luxury and stylish clothing. You’ve had a small taste of our journey. Now it’s time to start your own. Indulge in pleasant conversations over a glass of champagne or an exotic cocktail by one of our expert mixologists at the Luminous Lobby Bar. Enjoy a stylish spot with a warm atmosphere accompanied by the sounds of pleasant lounge music. A seductive showcase of creatively prepared dishes with Mediterranean influences. Ultra-stylish with stunning view over the sea, Kyma Restaurant of Anax Resort features a dynamic yet warm space that invite guests to enjoy light, refreshing and scrumptious dishes, as well as a well-selected list of Greek and international wines and cocktails. It is the perfect place to indulge in a delicious culinary journey. Dine and wine at the most atmospheric setting possible with remarkable tastes of creative cuisine. The restaurant depicts splendidness and delicacy while menus are prepared by a team of chefs with an international background and experience. Gluten-free delicacies are also available. The personnel will gladly explain in detail anything you might want to know about the menu and will ensure that your culinary experience remains memorable. An epicurean heaven at the heart of this vibrant Mykonos resort.